There are a handful of Hamilton models that did not show up in catalogs. One was the 1928 Oval. Another was the 1946 Vancott. 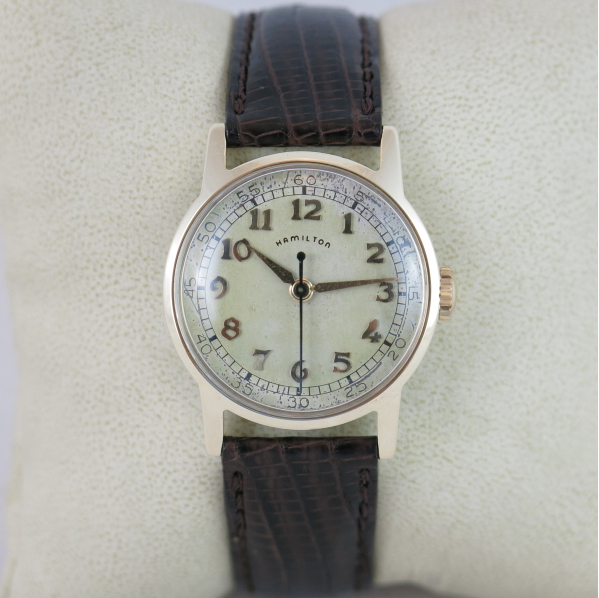 I say 1946 as a guess since the watch may have been introduced after WWII - once non-military production resumed. Without a catalog it is hard to say for sure. Since it's not in any of the catalogs, nor advertisements (that I'm aware of), I don't have any marketing material to describe it. As informed as I may be, I am walking in the footsteps of much more learned Hamilton collectors like Mark Cardelucci, Tom Diss, Rene Rondeau, Brian Girouard and Will Roseman. In fact, the Vancott was really only discovered and identified as an authentic model within the last 10 years or so, thanks to the research of others. The model comes in two different case materials, solid 10K gold and solid 14K gold in yellow. The 10K version has a stainless steel back while the 14K version has a solid gold back. Otherwise they look identical. According to Will Roseman's site, about 3,000 Vancott's were created, one third of them in 14K but no one is sure how many were actually released. The 14K version is stamped 14K inside the case back. The 10K version is stamped 10K on the back of one of the lugs. Inside is a 6/0 sized 17 jewel Hamilton 987S movement - which was introduced in 1940 and used mostly in sweep second military wrist watches. Although the Sentinel and the Secometer also used the 987S. 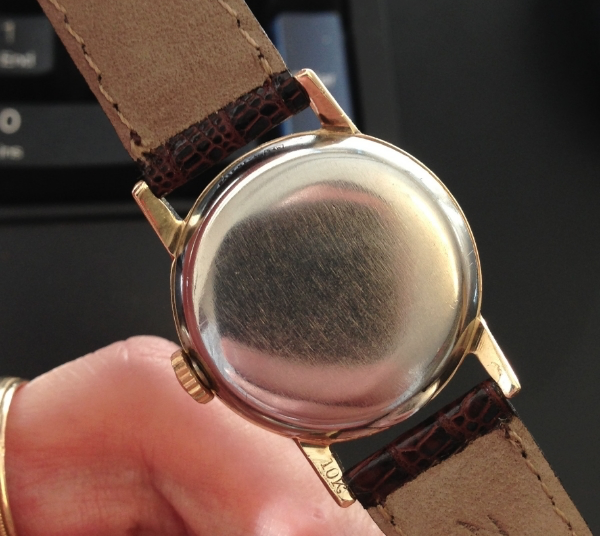 In fact, the sterling silver dial with solid gold applied numerals on the Secometer is the same as on the Vancott. When you see a Vancott, the first thing you will think is it might be a franken version of the Secometer. The lugs are straight and with a stainless steel back it's unlike any other Hamilton model from the period. 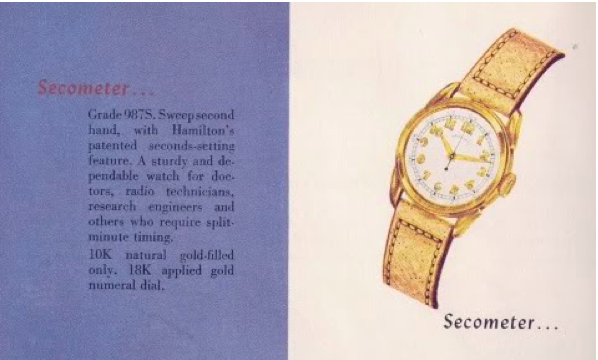 In fact, the Vancott is the first Hamilton model to use a gold (or gold filled) bezel paired with a stainless steel back. Other watches would follow suit in the 1950's and '60s. I recently landed a Vancott... the first I've ever laid my hands on. Once I cleaned it up it's turned out to be a very sharp looking watch. Paired with a genuine teju lizard strap, it's a new personal favorite. In the shot below you can see the stainless steel back and the 10K stamp on the lower lug.